Custom Flooring Altamonte Springs offering wood, tile, stone, and more..
At Ability Wood Flooring, our custom floors are a reflection of our company. Built tough and sturdy, the floors we sell are designed to hold up to everyday life. 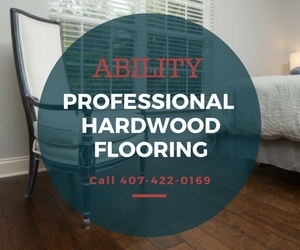 Based in Orlando and serving businesses and homeowners in Altamonte Springs, FL and neighboring areas, Ability Wood Flooring has been in business for more than 65 years. We customize flooring that is intended to make a lasting impact. Did you know that you can customize various floor types, including wood, tile, and stone? Homeowners in Altamonte Springs, FL choose our local and family-owned business to deliver uncommon floor designs on time – and according to outlined specs. Tell us your needs, and we’ll make it a reality. This 3-step process is all it takes to transform your home into a dream haven. Custom Options – Order tailor-made flooring that suits your personal style. We customize all types of flooring, including tile, wood, stone, and more. Quick Turnarounds – Get your custom floors delivered and installed within days, not weeks. All designs are done in house to cut unnecessary time and expenses. Unparalleled Customer Service – Ability Wood Flooring has earned a reputation for being one of the best customer-centric flooring boutiques in the region. We’ve done this by always putting you, our customers first. We’re respectful of your time and investment and always go above and beyond for every person who walks our way. All-In-One Services – Our wood floor installation company in Altamonte Springs, FL manufactures, delivers, and installs custom flooring at competitive rates. In addition, we offer floor restoration options, including sand and finish services for all types of hardwood flooring. Wood Flooring – Perfect for modern or rustic settings, wood flooring offers timeless appeal. Our current technologies provide a plethora of opportunities to play around with colors, textures, and cuts of hardwood flooring, regardless of the species. In addition, homeowners in Altamonte Springs, FL moreover have the option to select engineered hybrids, which mitigates concerns about seasonal changes. Tile – Replicate the rich patina of hardwood – on tile flooring. Or, go with the rich elegance of natural stone. Either way, the days of limited tile patterns are long gone. Stone Custom Flooring Altamonte Springs, FL – Beautiful and earthy, this centuries-old flooring is designed by nature to withstand the elements. Whether you’re shopping for indoor or outdoor flooring, our team of knowledgeable experts has the tools and know-how to customize the look of all types of stone flooring. Think travertine, marble, slate, and more. Bathroom Flooring – Set up a design that won’t drain your energy. Infuse your surroundings with new colors, textures, and patterns of wood, tile, or stone. Kitchen Flooring – What ideas are you baking up right now? Describe your dream kitchen flooring, and we’ll produce, deliver, and install it for you. Call Ability Wood Flooring at 407-422-0169. We are a family business who offers an array of flooring products and installation options that is paired with a 65-plus-year commitment to integrity, quality, and reliability—now, and for generations to come.